During part two of our What is Necessary? series last week we discussed “the gospel.” We looked at the history of the word “gospel,” from the Greek Evangelion, which loosely means “good news.” We learned that “good news” was the Roman Empire’s term for the information its orators, called evangelists, distributed throughout the Empire. The term “gospel” was usurped by early followers of Jesus to both protest the Empire and proclaim the real good news of Jesus Christ: that God and human are inseparable. From there we discussed several interpretations of the good news written about Jesus in the gospels of Mark, Matthew, Luke, and John, and the gospel Jesus teaches and lives, which reveals God’s all-inclusive, vision-changing, soul-awakening love, infinitely and intimately bound together in the flesh of the universe. We can discuss our ideas about “the gospel of Jesus Christ” because stories about him and the history of his Jewish people have been preserved for thousands of years, first orally, then later in written documents. Many of these are collected in the Bible. Others are preserved in extra-biblical texts. Hundreds of fragments from ancient versions of scripture are still being discovered around the world today. The Bible is a collaborative work. For thousands of years, every story in The Bible was written and rewritten by many hands and retold by many voices. The diverse documents in the Bible are recollections of a people’s heritage and their faithful perseverance as they develop a social identity. In the Bible, we read the ancient Jewish people’s questions and answers about community, the nature of God, God’s interaction with humans, the origins of the universe, and other existential questions we still ponder today. The Bible we use today is a collection of these ancient musings. It contains letters to and from people asking timeless questions that profoundly affect the way we view ourselves, each other, and our planet. The Bible includes short morality tales akin to Aesop’s Fables, commonly called parables; letters to and from people and faith communities; and epics like Genesis and Revelation. The people in the Bible wrestle with the consequences of their actions, just like us. They wonder why bad things happen to good people. They struggle with civil justice and imagine a God of ultimate righteousness, upon whose idealized, perfect actions they base their own civic ordinances. The Bible reveals our struggle to understand the chaos in our lives and our hope that there is some benevolent force providing comfort in the darkest days of our souls. The Bible also reveals the need for the answers to our quests to remain fluid. From Genesis to Revelation, we see a transition in human thinking from a God and society of retributive justice to a God of forgiveness, and a world of peace, an ideal literally embodied in the parables of and about Jesus Christ. The original Hebrew Bible upon which our Bible is based was a living document. The Rabbis in charge resisted writing anything down because they were afraid that once written, the open dialogue about God, the meaning of life, and the Jewish people’s place in the cosmos, would be forgotten. Ancient people gave writing intense authority. The ability to read and write beyond the basics was rare, so written documents carried tremendous weight. Initially, these stories so many people now call “The Word of God,” were not holy, untouchable, infallible, God-scribed magical tomes, but were, instead, understood as words about God. A conversation. Scripture is a breathtaking example of human creativity full of our musings, ramblings, contradictions, hopes, dreams, disappointments, and jubilations. These stories were intended to inspire, not to be sanctified. The Bible is an incredible collection of ancient thought, and we are fortunate to have the compilation available today. We should remember, though, that it was assembled in a highly charged political environment in the 4thCentury, by a bunch of Western Europeans who woefully misunderstood the Middle Eastern context of The Bible and did precisely what the Rabbis warned against: they glorified the texts. In America, today, glorifying the Bible is still part and parcel of many denominational creeds. In fact, I would say that for many Christians, the Bible is more important than Christ. 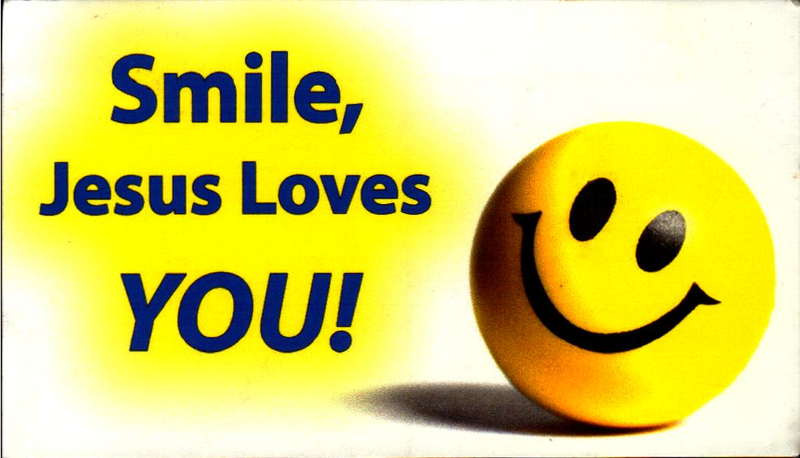 For example, in my recent travels, I stumbled upon one of those little Christian cards that drop out of used books or pants pockets. 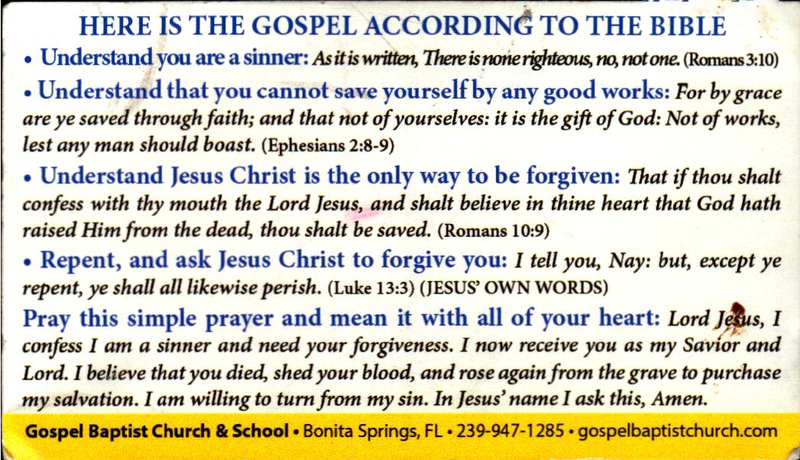 These cards present a version of the gospel that is affirmed by many American Christians, even though many others (myself included) reject this particular Christian brand. I suspect we’ve all at least heard this language before. Perhaps in the past, some of us have used this language to describe our relationship with God. Try to read the card without emotion and judgment. It is one interpretation of one Biblical theme. In keeping with our rabbinical tradition, let’s enter into conversation with it and see what our souls reveal. Question: Knowing what you do about the gospel and the Bible, if you could write “The Gospel According to (Your Name),” what would it say?